Church Avenue might seem an enigma to most modern day residents of Knoxville. Under the name Church Ave., it extends from Hall of Fame Drive west to Henley Street. In the stretch, one comes across only one church, First Presbyterian. It, however, faces State Street, so really there are no churches facing Church Avenue. What makes things even more confusing is that Church Street United Methodist Church, is on Henley Street, two blocks south of Church Avenue. Obviously this wasn't always the case. Church Street Methodist, was once located on Church Avenue, as were several other churches. Church Avenue was once a thriving thoroughfare teaming with residences and businesses (and of course, churches). Today, however, one might argue that Church Avenue has seen more demolition than any other street in downtown Knoxville. Every block of Church Avenue has suffered from demolition and, excepting the block where the Knoxville Hilton stands, each now sports a surface parking lot. 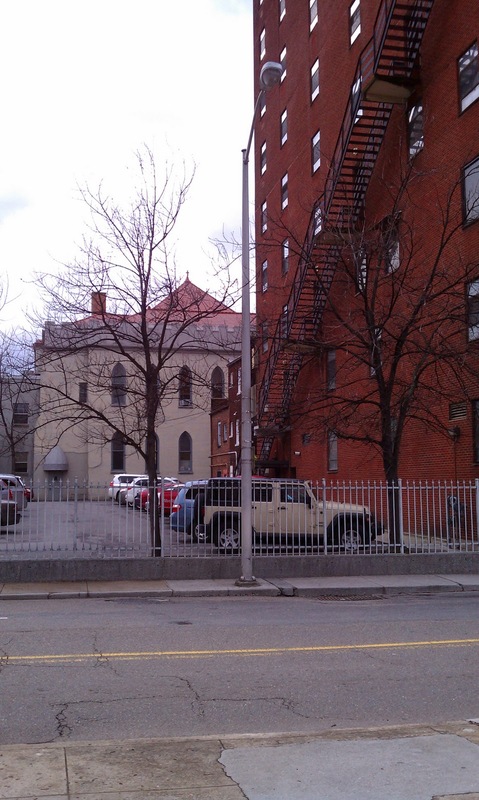 Our subject property is today a surface parking lot, located behind the St. John's Episcopal Church. If you were to walk there from Gay Street, you would turn west at the surface parking lot, go one block to the large surface parking lot on the right, and it would be the surface parking lot across the street. But of course, this wasn't always the case. 414 W. Church was once one of the most visited spots in downtown Knoxville. That's not to say that most enjoyed visiting because 414 was the location of the Mann Mortuary. If you lived in Knoxville between the 1920s and 1970, you're life likely included a trip to Mann's. The parking lot at 414 W. Church Ave. taken from the parking lot across the street. The empty hole, between the Ely building and the modernist Walnut building, where Mann's once stood. The passing of Mann's mortuary went little noticed and without any fanfare, an ironic fate considering that so many came to this place to say their goodbyes. 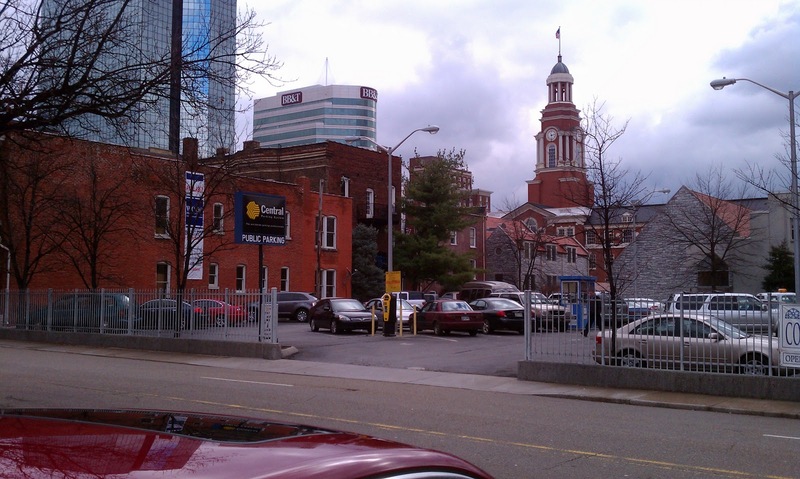 Mann's funeral services began in 1880, with the establishment of Knoxville's first undertaking services, known as Mann and Johnson's. The original business was started by Edward B. Mann and was located at 98 Gay Street (good luck finding that address in modern Knoxville). This was an unlikely undertaking (excuse the pun) for a fellow who had been a railroad repair man. 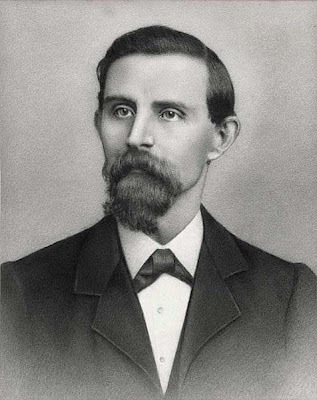 Mann's partner, Richard Johnson, retired in 1892 and the company became known as E.B. Mann Undertaking Co.
Mann's company grew considerably during the first two decades of the twentieth century. Most Knoxvillians would have recognized his team of beautiful, white horses that pulled the funeral fleet. 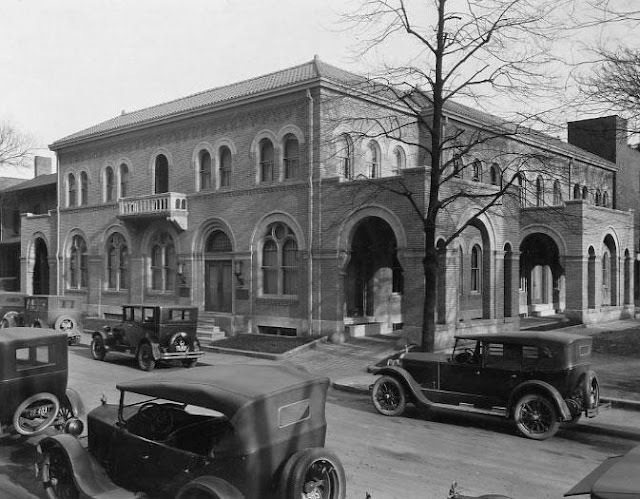 It was in 1924 that Mann expanded and built a fully modern funeral home on Church Ave. at the site of a former J. Allen Smith residence (perhaps the most publicized loss for local preservationists was J. Allen Smith's large residence on Lyons View). A 1930's advertisement for Mann's describes the progress made in the mortician business. It proudly proclaims that Mann's is on the cutting edge of everything modern in funeral services, offering "everything new and helpful in the profession". This is a far cry from the ads on television today, showing an Andy Griffith-like depiction of the down home, traditional, wholesomeness of Rose's funeral homes (Rose joined Mann in 1923). Mann's, in that day, was a grand funeral parlor, a landmark. Mann's from the east, 2nd Presbyterian Church in background (site of Lawson McGhee library, church moved to Kingston Pike in 1954). Mann's beautifully arched doorway and triple arched windows. The funeral business continued at 404 W. Church for some time and business was booming. 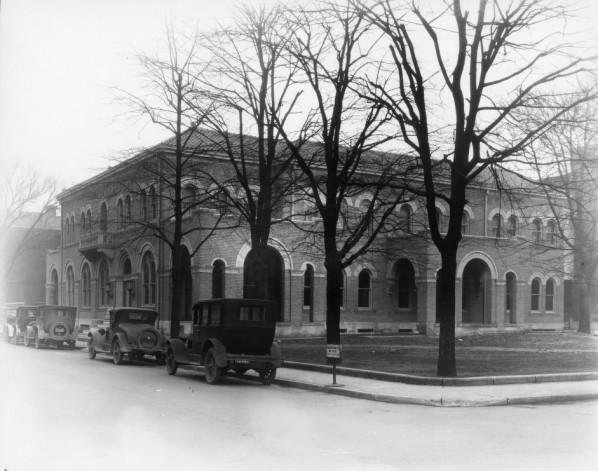 In the late 1940's, Mann acquired the adjacent eastern residence and demolished it for covered parking. Isn't that ironic? Mann kept it's fleet of hearses and other funeral cars at a warehouse on Front Street (think Neyland drive at Volunteer landing). 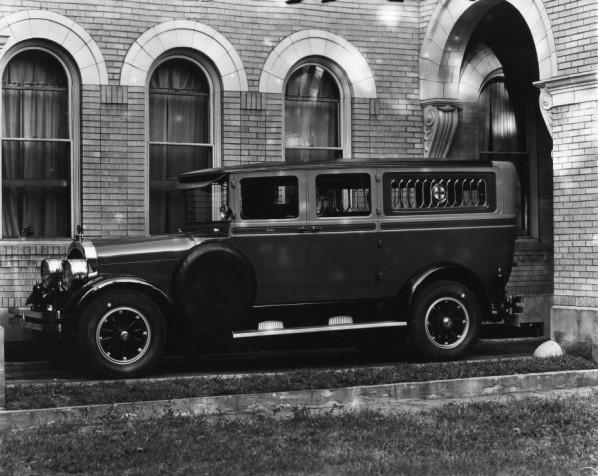 One of Mann's hearses parked in the portico. Mann's opened a funeral home in Bearden, on Kingston Pike in 1960. 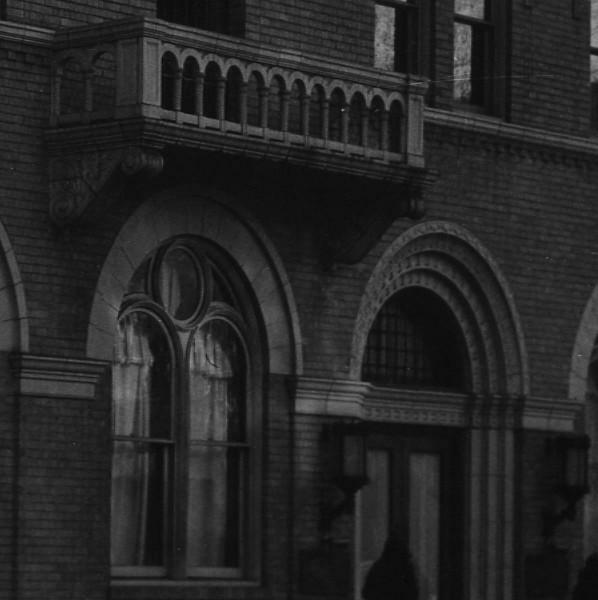 The funeral home on Church continued operations until 1970, when Mann's decided that the population had shifted away from downtown. The building was sold to the Volunteers of America. The VOA operated in the building until 1991. The building was sold to St. John's Episcopal church on September 16, 1991. 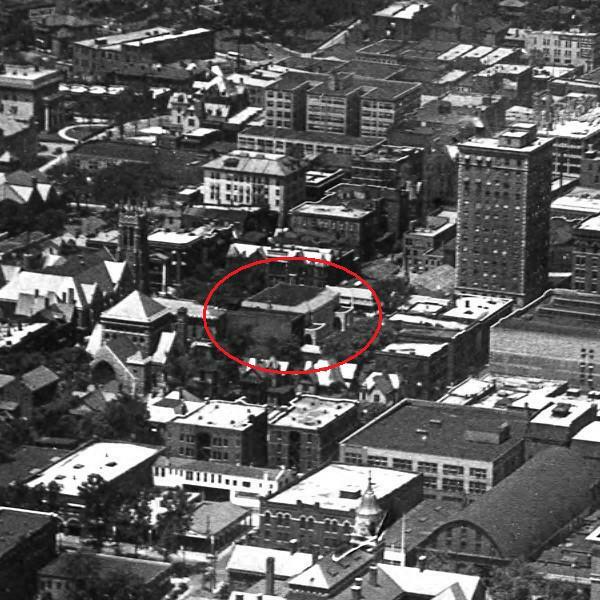 Mann Mortuary (circled in red), Knox County Courthouse in foreground, Tennessee General Building to right, St. John's Episcopal to left. Same red circle, no building. No one to whom I've spoken remembers just how it happened, but the building disappeared in 1992/1993. One would think that such a recent date would elicit some memories, but I've consulted with the great Jack Neely and even he isn't sure what happened exactly. I was alive and kicking around Knoxville and I don't remember it being reported. Common lore suggests, though, that St. John's Episcopal tore the building down for parking, plain and simple. A sad loss to the community for a few striped spaces. Knoxville has plenty of parking spaces and plenty of funeral homes, neither of which will ever replace the grand building that was lost at 404 W. Church Avenue. Photographs used with permission from the Knox County Library System, McClung Collection. What a beautiful building! That's a terrible loss for us today. And looking at that second red circle picture is depressing. I hate seeing all the vacant lots where gorgeous buildings once stood. I hope to see a lot of those vacant lots developed. Ditto on what Andrea said. I hope we can keep everything we still have (you may recall St. John's attempt to tear down a portion of Walnut Street for parking just a month ago) and fill in the parking lots with some cool developments to at least restore some of the urban fabric we had. Nick, it was exactly that action by St. John's that prompted me to start this blog. I hope to preserve historic structure in Knoxville by making people aware of what has already been lost. In the meantime, as I write this, the downtown design review board is meeting to decide the fate of those walnut street buildings. Here's hoping they survive. 98 Gay St., for what it's worth, was the building south of the Tribune Building, now the Mechanics Bank Building at 612 S. Gay. So it's kind of hard to point at the address exactly - about half of it is now Journal Place, and the other half is somewhere under the [Journal] Arcade Building. I've been told that the old Mann's Building had a fire before it was torn down, though I've never gotten a clear idea of the extent. Hi. I just discovered your blog and I love it. I am curious. 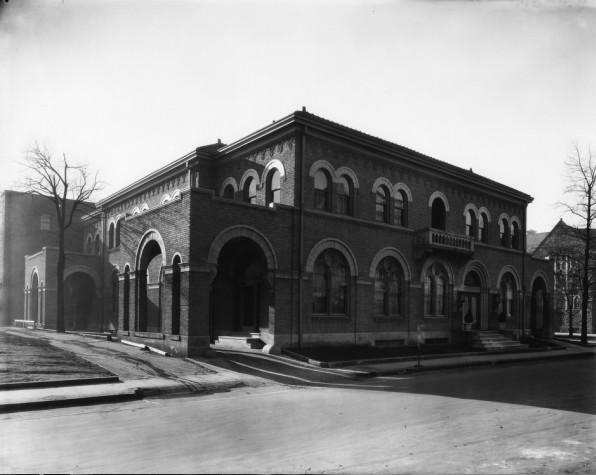 Do you know anything about the "Volunteers of America Home for Unwed Mothers and Children" which stood at 312 Magnolia in 1930?